Health and Human Services Secretary Kathleen Sebelius announced the next steps for providers who are using electronic health record (EHR) technology and receiving incentive payments from Medicare and Medicaid. These proposed rules, from the Centers for Medicaid & Medicaid Services (CMS) and the Office of the National Coordinator for Health Information Technology (ONC), will govern stage 2 of the Medicare and Medicaid Electronic Health Record Incentive Programs. Stage 1 (which began in 2011 and remains the starting point for all providers): “meaningful use” consists of transferring data to EHRs and being able to share information, including electronic copies and visit summaries for patients. Stage 2 (to be implemented in 2014 under the proposed rule): “meaningful use” includes new standards such as online access for patients to their health information, and electronic health information exchange between providers. Stage 3 (expected to be implemented in 2016): “meaningful use” includes demonstrating that the quality of health care has been improved. CMS’ proposed rule specifies the stage 2 criteria that eligible providers must meet in order to qualify for Medicare and/or Medicaid EHR incentive payments. It also specifies Medicare payment adjustments that, beginning in 2015, providers will face if they fail to demonstrate meaningful use of certified EHR technology and fail to meet other program participation requirements. In a November 2011 “We Can’t Wait” announcement (http://www.hhs.gov/news/press/2011pres/11/20111130a.html), the Department outlined plans to provide an additional year for providers who attested to meaningful use in 2011. Under today’s proposed rule, stage 1 has been extended an additional year, allowing providers to attest to stage 2 in 2014, instead of in 2013. The proposed rule announced by ONC identifies standards and criteria for the certification of EHR technology, so eligible professionals and hospitals can be sure that the systems they adopt are capable of performing the required functions to demonstrate either stage of meaningful use that would be in effect starting in 2014. A technical fact sheet on CMS’s proposed rule is available at http://www.cms.gov/apps/media/fact_sheets.asp. A technical fact sheet on ONC’s standards and certification criteria proposed rule is available athttp://www.healthit.gov/policy-research. The proposed rules announced today may be viewed at www.ofr.gov/inspection.aspx. Comments are due 60 days after publication in the Federal Register. Query Health is an Open Government Initiative that is establishing the standards and services for distributed population health queries. Query Health standards will be used to send questions to clinical data sources which return aggregate measures of population health that can be used for many purposes including disease outbreak monitoring, post-market surveillance, comparative effectiveness research, quality and performance measures. Query Health is pleased to announce the commitment of leading healthcare organizations to pilot the Query Health standards and specifications. Query Health also plans to present its progress on proposed standards and reference implementation at the HIMSS conference in Las Vegas, February 20-24, 2012. And in an unexpected twist, Query Health standards will deliver potential benefits beyond the scope of distributed population queries. Today, Query Health is announcing that the Primary Care Information Project (PCIP), within the New York City Department of Health and Mental Hygiene, and the New York State Department of Public Health have announced plans to pilot the Query Health standards and reference implementation. PCIP recently won awards for their work on distributed queries including the 2011 HIMSS Public Health Davies Award of Excellence and Healthcare Informatics first place Innovator Award. They will be using Query Health standards to expand their existing population health monitoring network from an existing 1.6 million ambulatory patients to encompass citywide HIE organizational coverage of both inpatient and outpatient encounters. This enhanced system will support optimal allocation of limited public health resources. What will be shown at HIMSS? ONC will host a demonstration of Query Health’s progress on the reference implementation including a live demo of distributed query execution. · ONC Booth Theater on Wednesday February 22nd at 9:45 AM. Are there benefits beyond distributed population queries? The path for a quality measure today is measured in years from the time of measure definition to delivery in vendor systems and deployment in EHRs. Want another quality measure? Wait several years. In collaboration with HL7, NQF and CMS, Query Health standards will enable Health IT vendors to dynamically respond to queries, including queries that align with quality measures. So assuming the data is being captured, the cycle time could go from years to days. The ability to generate measures nationally in a short cycle time has powerful benefits for patients, patient populations while enabling researchers and healthcare organizations to substantially reduce costs and increase speed. Query Health was launched September 2011, with approximately 100 committed member organizations representing diverse healthcare stakeholders contributing to the project. Today, when health researchers develop questions about a population, in many cases they manually pose these questions to care delivery organizations, which employ technical teams to manually generate queries and produce reports. Even where distributed queries are automated, the costs and time to link each data source are unacceptably high. 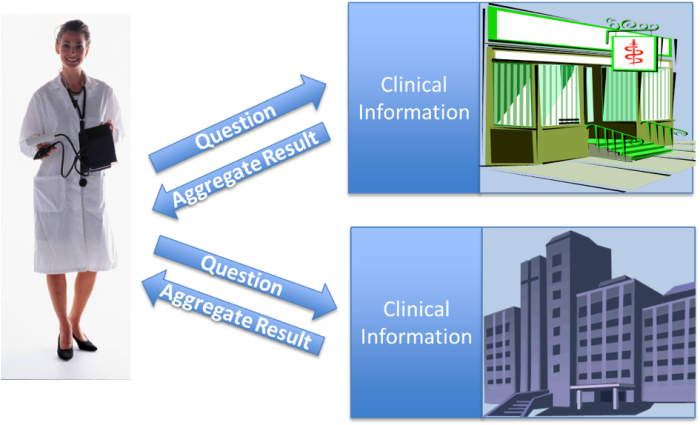 The Query Health Initiative will make this much more efficient: the question can be delivered in a format that will be interpreted automatically by an HIT system. The HIT system will then generate a report with the “answer” to the query. Questions can be sent to many different types of data sources including providers’ EHRs, payers’ clinical records, personal health records and health information exchanges. Decisions about which queries to process are under control of the data owner and the aggregated results protect patient level data, which remains safely behind data owners’ firewalls. For more information on Query Health initiative, visit the Query Health website http://www.QueryHealth.org or contact admin@siframework.org. Michael Buck is the clinical work group leader for Query Health and director for the NYC/NYS pilot. Dr. Buck is also Biomedical Informatics R&D Manager at New York City Department of Health and Mental Hygiene and Adjunct Associate Research Scientist at Columbia University’s Department of Biomedical Informatics. Rich Elmore is the ONC Coordinator for Query Health.